I was reading something online (and now I can’t remember where or by whom), but it talked about service and love being synonymous. The timing is perfect in my life for this message. My grandmother is ill, and my family has rallied around, ensuring she is well-taken care of. She keeps saying how she will repay us (as if that’s a remote concern for anybody else) when all I can think is how much I love her. I would do anything for her. Because being of service to somebody, blood relative or stranger, is an act of love. What better creature to depict this than man’s best friend, who often shows his love through his service. 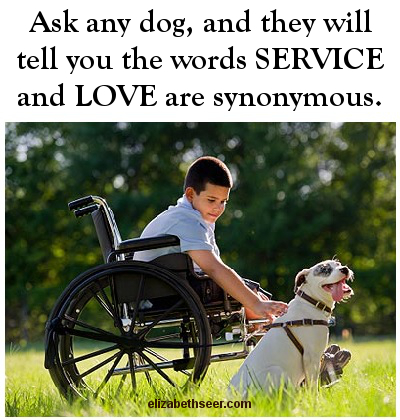 be of service, be service, dog lessons, dog love, love and service, service love, show love. Bookmark.